Robert William Kilough, age 87 of Coldspring, Texas, passed away Wednesday, September 12, 2018. He was born December 5, 1930 in Goose Creek, Texas to parents John and Darcus Kilough who preceded him in death along with his wife, Charlie Kilough; sons, Robert C. Kilough and Paul J. Kilough; sister, Darlene South; and brothers, Jim and Tom Kilough. Mr. Kilough extensively studied the Bible. He had a passion for fishing. Above all else he loved his family with all of his heart. Survivors include his daughter, Karen and husband Martin Phillips; son, John and wife Han Kilough; sister, Dottie and husband George Cain; brother, Johnny and wife Bernice Kilough; grandchildren, Luci and Tom Stafford, Tammy and Brady Hoover, Jeremy Kilough, Kristopher Kilough, Samantha Kilough, John Kilough, Magan Phillips, Sabrina and Robert Shlemon, Jordan Phillips, Charlie and Luke Reaves; great-grandchildren, James Stafford, Alex Stafford, Sydni Hoover, Ketcher (Cash) Hoover, Zildjian Reaves, River Reaves and Mahaya Phillips; many beloved nieces and nephews. Visitation will be held from 12:00 p.m. – 2:00 p.m., Saturday, September 22, 2018 at Pace Stancil Chapel, Cleveland, Texas. 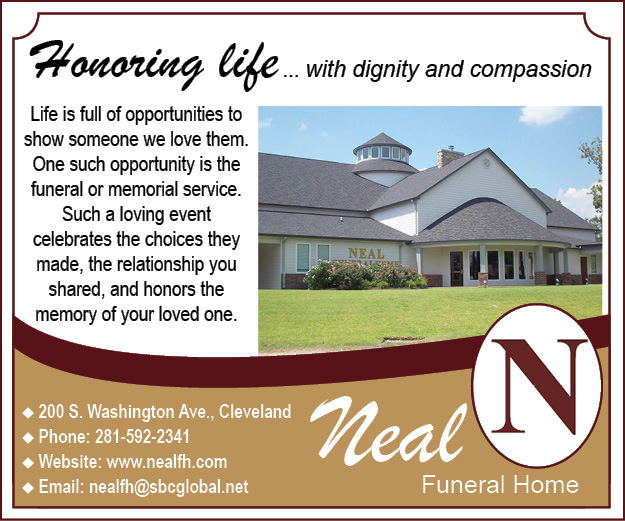 Services will follow starting at 2:00 p.m., Saturday, September 22, 2018 at Pace Stancil Chapel, Cleveland, Texas.